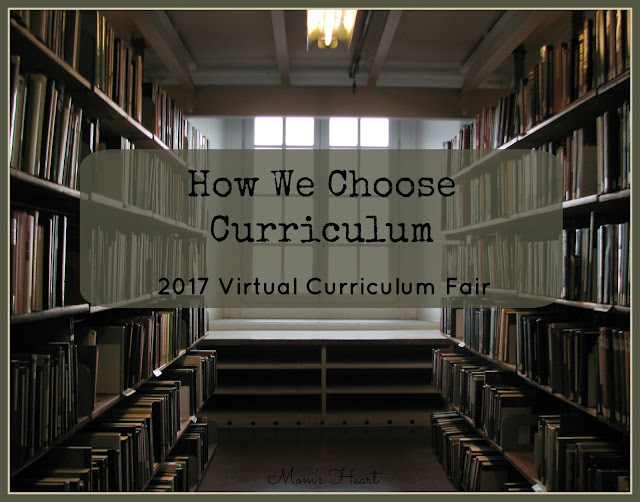 I haven't participated in the Virtual Curriculum Fair in awhile, but I decided to jump in again this year since it's always fun and refreshing to get ideas from fellow homeschoolers. The Virtual Curriculum Fair is hosted by Homeschooling Hearts and Minds, and is a way for homeschool bloggers to come together and share ideas, inspiration and the "nitty gritty" of homeschooling. The VCF will be a five week series, and each week we're going to give you a peek into our homeschool. Since we all have unique homeschooling styles, you will see many different perspectives on the same topic, so I encourage you to visit everyone who is participating and peek into their minds and homeschool! The first week's theme is See How We Learn/Welcome to the Fair! I always share what curriculum we're using each year, and usually the why, but I don't think I've ever really shared how I choose the curriculum. So that's what I'm going to do this week. I'm going to share my process for narrowing down curriculum choices for my family. The first thing I do is evaluate how things went the previous year--do we like what we used? Was it easy for me to implement? Did the kids look forward to that subject or groan when I pull out the books? Do we need to change? If we need to change . . . why? Was it tedious for me? Did the kids complain because it was boring or didn't meet their learning styles? Knowing why we want to change can help me focus on what type of curriculum might be a better fit. Research different methods and decide which one is most consistent with how you want your children to learn and your overall goals for their education. As your children's needs evolve, and your teaching style evolves, you might find that the reason your previous curriculum isn't working is simply because your philosophy has changed. Changing your "method" or becoming more eclectic is normal, and often a necessary part of the homeschooling process. We've always been literature-based. There is just something so simple and satisfying about learning through real books, so I tend to prefer curriculum that is based on, or at least compatible with Charlotte Mason's philosophies. There are so many different methods though, and you might find that Classical or Unschooling or another method works best for you and your children. Just don't be a slave to any one method simply because you identified with it first, or because it's what all your homeschool friends follow. It's okay to be different. If you identify with different aspects of different methods, it's okay to be eclectic and pull out the best of each method in order to make your learning environment true to your family. Quiz: What Kind of Homeschooler Are You? Sometimes there is not much research required, because we stick with a curriculum we love. When changing things up though, it's important to research using a few key ideas. Look at samples and read reviews to make sure it's the direction you want to take. Teaching Style/Prep Time - I tend to prefer teacher's manuals that are casual and give ideas and suggestions, but aren't scripted and/or full of prep work. I don't mind occasional prep work, but I don't want tons of copying, organizing, making props or gathering obscure supplies for projects or experiments. You might like detailed schedules and verbatim lesson plans, and you might enjoy the prep and planning, and that's okay. Find what works best and doesn't overwhelm you. I'll stick with the relaxed manuals! Learning Styles - It is important to take the learning styles of your children into consideration. Are they a visual learner? They might like video based learning. Do they love crafty/hands-on projects? Find programs with lots of art projects and experiments. Use a living book program for your bookworms. You want to find something that meets their needs too, not just yours. Ask me how I know. Family Dynamics - If you have an only, this isn't likely to be an issue, but families with multiple school-age children must find a balance. I like to do unit studies and use living books because it allows me to do multiple subjects together as a family. My kids do individual language arts and math, but we do Science, History, Bible, Art, etc together. It keeps my prep work down, and my kids still prefer to work together anyway. If you have multiple kids that need "their own" work, you might consider programs that allow more independent study or self-directed learning in order to help you split your time appropriately between children. Google - "Review of XYZ Curriculum" and you'll find reviews in homeschool forums and blogs. Wait, WHAT!? I'm sure you're thinking that the whole point of having homeschool friends, support groups and mentors was to learn from those who have been-there-done-that. Well, yes and no. Don't ask for advice first. Research and narrow down your choices based on the above criteria first. The reason I say this, is because most of the time when you see a generic question like "What spelling program should I use for first grade?" you'll see one of two things happen. You'll get 32 different suggestions, and feel compelled to research all of them, only to find out that most of them won't be relevant to your homeschool philosophy or your child's learning style. Or, you'll see 32 responses, but only two or three very popular programs are suggested. If you take that to mean they're the only two or three quality programs out there, you could be missing out on some excellent curriculum that wasn't mentioned, just because their advertising budget isn't as large and people aren't as familiar with them. I prefer to start out doing my own research, narrow down the selections that are most relevant to our needs, and then ask specific questions or for experiences related to those few programs. This process is so much more efficient and the responses are more valuable in the long run. So, if you could give a new homeschooler advice on choosing curriculum, or even an experienced homeschooler who's frazzled with their current curriculum, what would it be? I invite you to see how my fellow bloggers learn in their homeschools! Good advice! That is pretty much the way I go about it, too! My advice is to find what fits each child's needs. All three of mine learn differently from each other. And advice from another homeschooling mom that made a difference years ago was simply the freedom to not have to complete a book if it isn't working. Could not agree more with the advice here. This is very much how I choose my curriculum. Choosing curriculum is the hardest part! There are so many good things out there. Welcome back to the VCF!